The president of the British republic of Nigeria has recently been consistent in flaunting his political illiteracy especially on issues of Biafra and her agitators. His nervousness and fear of the re-emergence of Biafra has led him to making disreputable utterances that questions his understanding of governance and the rule of law in general. Buhari has on Tuesday night, during the breaking of fast dinner at the State House in Abuja cowardly warned Biafrans agitating for their freedom to desist from such act. He further boasted of the Biafra genocide committed 1967-1970 and bragged that he will repeat his actions and accept the responsibilities if need calls for it again as he made reference to Gowon’s speech. 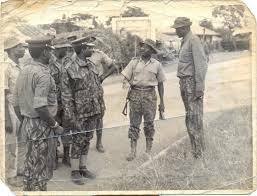 In Buhari’s statement, ‘’Biafra agitators and the militants should reflect very seriously on the civil war of 1967-1970 where about two million Nigerians lost their lives.…then somebody is saying that once again, he wants Biafra. I think this is because he was not born when there was Biafra…. Leading people is not a joke. It means accepting responsibility for good or wrong. To keep Nigeria one is a task that must be done’’. Recall that on November 21, 2015 at the Ahmadu Bello University (ABU), Zaria, during the investiture of the institution’s 7th Chancellor, Buhari made a similar statement: ‘’The agitation of those wanting to secede from Nigeria would be surmounted by the might of the federal government, as the continuous existence of the country is not, and would never be a subject of debate’’. In view of these utterances, it is evident that this dictator has not only failed to wake up from his unsuccessful first tenure as the president of this false contraption but also unlearned in the principles of governance. Biafra agitators are only expressing a natural law of self determination which fortunately found its way to the article 3 and 4 of the Draft Declaration on the Rights of Indigenous people by the United Nations. Article 3: Indigenous people have the right to self-determination. By virtue of that right, they freely determine their political status and freely purpose their economic, social and cultural development. Article 4: Indigenous people, in exercising their right to self determination, have the right to autonomy of self government in matters relating to their internal and local affairs, as well as ways and means for financing their autonomous function. Owing to the above Draft Declaration, Buhari’s threats to these agitators is a mockery to the rights of Indigenous people by the United Nations. Also, these persistent boasts of the genocide committed against Biafrans calls for an urgent visit and prosecution of all involved in that abominable and evil act. If Israel deserved it against the Germans, Biafra deserves it too. Right to self determination has given room for the emergence of many countries all around the world since the Independence of the United States of America of 4th July 1776 and Biafra’s case should not be an exception. Buhari should know that those agitating for the Independence of Hong Kong, Scotland and Catalona never experienced the respective wars these countries faced too. I will end with Daniel T. and Thomas B’s words: ‘’Governments derived their power from the consent of the government and whenever any form of Government becomes destructive of these ends, it is the Right of the people to alter or abolish it’’. Self determination a crime only in Nigeria.